Your child can dream like a superhero with these cool Catboy PJs just like their favorite character from PJ Masks! 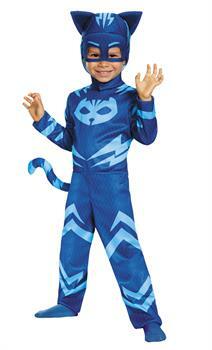 The child costume includes a blue jumpsuit with printed light blue details, tail and soft foam headpiece. A great child Halloween costume or for birthday parties or just as pajamas! Add your own socks. Fits child sizes 3T to 4T. Fits child sizes 4-6. .